Breaking Silence: The State of..
A look at “Made in America” products and their relationship with American manufacturing. Whatever happened to the “Good ol’days”? You know, the days when “men were men,” when the sound of the factory horn would signal the end of a work day and the return to a stable family home. A time where Americans had honor in their work, building up whole cities around new plants and mills. America wore the “Made in America” tag proud in those years. What happened? Today, what remains as a reminder of those years are shambles of old factories and vacant homes with overgrown lawns. And as more of these towns are lost, and more glass skyscrapers are built, no one seems to bat an eye at this lost demographic of people who depended on the American-made tag. This demographic is an oft-cited reason as to why Donald Trump won the presidency. Returning to the “Good ol’ days” was the basis of his rhetoric, which — for the most part — was rooted in false promises of jobs in industries that most experts agree will be gone in the decades to come. The strong infatuation with American made from the past carries over as a beacon for hope in a country changing rapidly. For the unemployed factory refinery workers, American-made industries still hold up against a globalized world. In some aspects, it is true that American manufacturing jobs have value, and data shows that the sector is not hurting as much as we romanticize it to be. The issue is that the amount of people out of work has outgrown the amount of people needed to operate manufacturing plants. Who should be held responsible? Should consumers make an added effort to buy American made products? Or should companies make greater efforts at keeping jobs domestic? There is a gray area. So long as a product is assembled in the U.S. using parts purchased from American distributors, the business can market it as American-made, even if the various materials and parts were manufactured elsewhere. Very rarely is a product 100 percent “Made in the U.S.A.” Most products you buy today — regardless of what their labels say — involve input from at least two countries or more. Stock Mfg. Co, for instance, makes clothes out of a factory here in Chicago. They are currently training in-house tailors to fully stitch and assemble pieces of clothing from the ground up. Once trained, manufacturing will move to a new factory, where Stock Mfg. will hold tours to expose people to the clothes making. A flannel runs about $88. Feeling each flannel, it’s easy to see how their product differentiates itself from cheaper competitors. The material is soft and thick, the way a flannel should feel — capable of withstanding the harsh Chicago seasons. The flannels are American-made, sporting a “Handmade in Chicago” label. “As a brand, our whole ethos is that we’re here, you can connect with us, we’re right down the street for people in Chicago and we care about the community. Everything is very engaged,” Moriarty says. So what makes the clothing from Stock Mfg. high quality? The materials imported matched with the labor practices of its domestic factory. The fabric is imported from Japan. Moriarty tells me as we chat that the best fabric is in Japan, with the exception of some denim found here in the U.S. The second contributor is design, then cut and stitching of the garment provided by the trained tailors. Companies like Moriarty’s that specialize in domestic products can be found scattered throughout the Chicago area — the reason consumers think American-made goods are no longer prevalent is because of the disproportion between the amount of domestic content in U.S. production lines and in store shelves. This is the perfect reflection of the divide in America and how we think of American products. One side views “American Made” as the individual parts and labor required to make that product, where the steel used in their car comes from. The second half views “American Made” as the design and quality of the product, how the product operates and makes them feel. When they buy a car, they don’t think of where the metal frame or individual headlight come from—they only think of how the whole car runs as a whole. What goes undiscussed is the opportunity globalization has created for blue-collar Americans. The best quality materials are no longer reserved for multinational companies. A small business can now make a product that is equal to — or in most cases better — than big name brands. The middleman refers to American distributors who purchase materials and parts from foreign manufactures and then sell them to American businesses for a cheaper price. A novice to the world of cycling, I walked into the Bike Lane on 2130 N. Milwaukee Ave. and was taken away by the different styles and builds of bikes in stock, all from brands I had never heard of. The shop’s two main distributors are located in Minnesota and Indiana. The distributors order parts from the manufacturers overseas and then sell them at a lower price to bike shops in the U.S. The high costs from dealing directly with foreign manufacturers are due to the minimum order amount required to place an order, as well as import taxes and shipping costs with the order. Every bike had its own unique touch — seat stitching, metal detailing, funky color patterns and added perks depending on the request of the bike owner. The bike I asked about was a custom build, a bike built from the ground up using a variety of parts from different brands, all to the exact specifications of the owner. It was priced at $1,400, a steal for the amount of careful detailing put into its build — a chrome black finish with a tan leather finish on the seat and handles. The middleman can help businesses keep manufacturers employed and simultaneously afford top quality products. The middleman makes it easier for a business like the Bike Lane to be more involved in the selection process to better curate a product fit for the people that come into their shop. 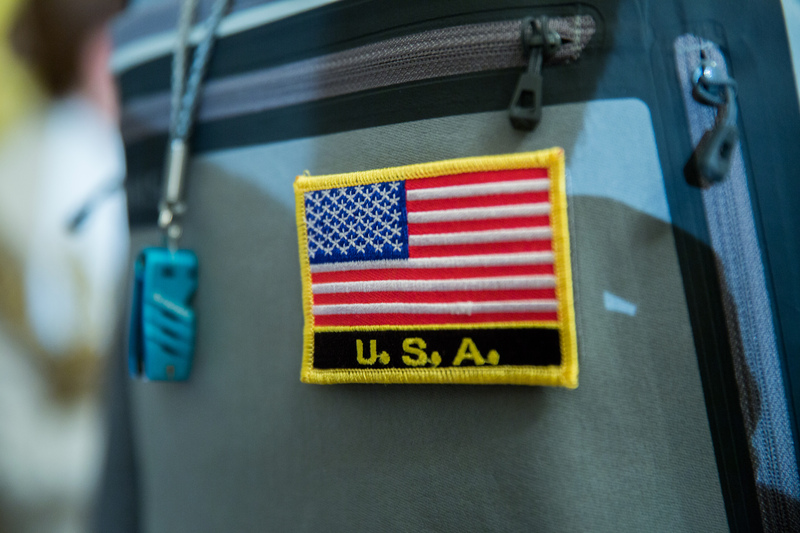 Ultimately, the “Made in America” tag is nostalgic. Products that sport the tag now are emphasizing their willingness to support the American labor force and economy. Yet in most cases today, that support is limited, either portraying the partial input of the American workforce, or a willingness to maintain part of the manufacturing process alive domestically. These are generalizations but they speak to a bigger theme of globalization, a faster-growing process that will determine the fate of American manufacturing in years to come.